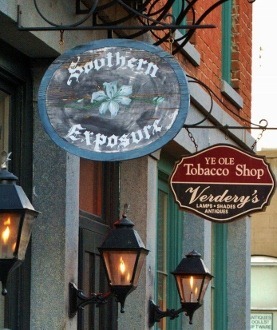 Shops of days gone by attracted customers with their “shingles” hanging outside. Your blog posts also vie for readers with public “signs”. Three in fact, and they compete in various venues for attention. They are your post title, illustration, and the first words of your post. Like it or not, these three “shingles” are all you have for your post to be noticed and to bring in your readers. You might argue that your regular readers subscribe to your blog or regularly look in. Even then, your post must compete for their time and interest. The title and that first illustration must draw their attention and the first words must be compelling enough for them to read on. So it is important that you spend some extra time to “spruce up”, or shape up, these three “shingles” of your post so they perform effectively in selling and bringing in readers. Consider the many places your posts are publicized. You likely have Twitter, Facebook, and maybe other social sites connected. These in turn may show up in still other places. Search results will find your posts. RSS feeds on your and other sites might show them. Some you may not even be aware of. Let’s look at how posts are mentioned in some of these places. On the right are a number of screen clips. The first two are from Twitter and Facebook. This is followed by a Google+ message. You can see already the different ways the post is seen. Twitter only shows the title. 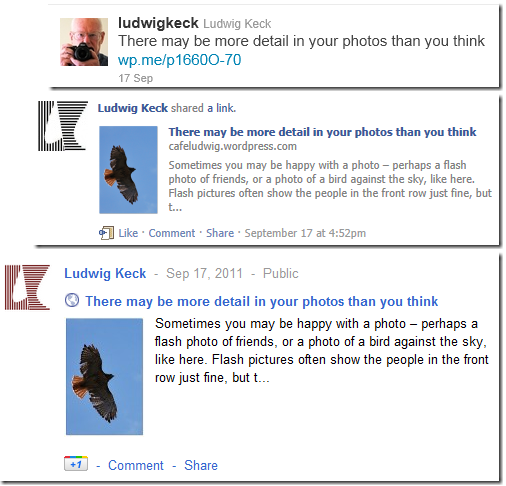 Facebook shows title, a thumbnail of the first illustration and a bit of the starting text. Google+ is very similar to Facebook, even to how much of the introductory text is shown. When someone searches for information using words that are matched in your post, the results may look like these three items from Google, Bing, and Yahoo searches. Here too, the title is shown followed by a bit of text from the post. There are other places to consider. 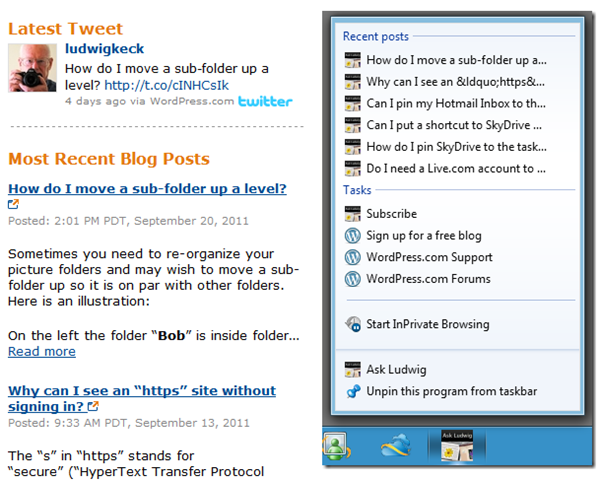 Here a couple of RSS feeds as seen in blog sidebars. These show only the titles. In some RSS feeds more information is shown when the pointer is moved to the title. Here is one such case. A fair amount of the introductory text is shown in a screen tip balloon. There are places you might not be aware of that also publicize your blog. Shown here is a clipping from my author’s page on Amazon. My latest tweets and blog posts are shown. When someone pins your WordPress blog to the Taskbar, right-clicking shows recent posts. In the jump list only part of the title is shown. The illustration of such a jump list also points out another problem. Non-alphanumeric characters are replaced with ugly HTML code. Well, I have illustrated a number of venues where your “shingles” hang out. These pictures also show some of the problems to keep in mind. So here are some tips to help you put your best foot forward. The title of your post is the one “shingle” shown in all the places. So it it the most important in catching the readers attention. State the topic in your title. Think in terms of newspaper or magazine article titles. Tell what it is about. On this short phrase most readers will base their decision to continue or skip. Make them want to continue. In many places the length of the information is limited. The most severe is the Windows Taskbar jump list. Keep in mind the limit for tweets, the title and the link must fit the 140-character limit. This is a strange requirement, but a number of “venues” replace apostrophes, hyphens, quote marks, and such, with HTML code. That really detracts from the appearance of the listing. Stick to just letters and numbers in titles, use the marks in your post text when appropriate. Appearance matters. A fun title can perk up a readers attention. Use it when you can but avoid the nauseating teasers of television news fame – even the professionals can’t do those well. Blog posts are more fun to read and often more informative when they are well illustrated. Select your first illustration carefully, that is the one that may be shown in a listing somewhere, it may well be the item that catches a readers eye. Illustrations, like the text of your article, must be your own. Copying photos or text from “Internet resources” is not only plagiarism, it can also get you into legal trouble. If someone’s search leads to your post, it may also show the source of the “borrowed” material. Nothing will destroy your credibility more. The first words of your blog post may be shown in listings. You can see examples in the illustrations above. These are the words that must convince your reader to click to keep reading. People are in a hurry these days. We glance at headlines, the lead photo, and maybe read the first sentence. This is what we all do, your readers are no different. Make the first words compelling. After you finish the draft of a post, go over it with these tips in mind. With a catchy title, a neat illustration and a compelling introduction, your blog posts will be more widely read and enjoyed. You might even get some complimentary comments!